During his reign, Herod the Great (37-4 BCE) undertook massive building campaigns all over the country, and especially throughout Jerusalem (including the Second Temple). 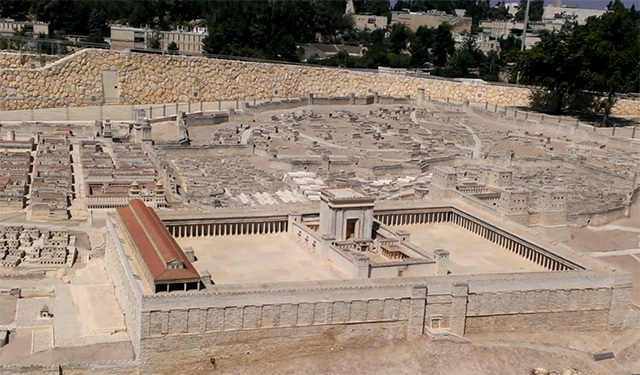 This work transformed the city into a worthy world capital (as can be seen in the scale model at the left on the grounds of the Israel Museum; hover over to enlarge; photo © and courtesy Donald H. Sanders). However, for the next six decades following his death, rule over the city was filled with tension between the Romans in charge and the local population. The divisions reached a boiling point in 66 CE with a full-scale revolt against Rome, but also among different factions within the Jewish population. Eventually, in 70, a huge Roman army led by Titus conquered the city, leaving it in ruins and in flames (the battle is also discussed at length by the Roman historian Josephus, in the Jewish War). The celebration of his victory and of the spoils he brought home are depicted on the Arch of Titus, just on the edge of the Forum, in Rome. Evidence of the destruction he left in his wake can be found throughout excavations that reach the Roman levels. The Burnt House was the first house excavated that showed clear signs of the burning of the city in 70 CE. Nahman Avigad uncovered the house in 1970. The house had scorched masonry and charred wood beams and layers of thick ash. A cross-section of the debris showed the collapse of burned upper wall stones, remains of charred beams, and then ash, pottery sherds, iron nails, broken glass, stone vessels scatterd across the floor. 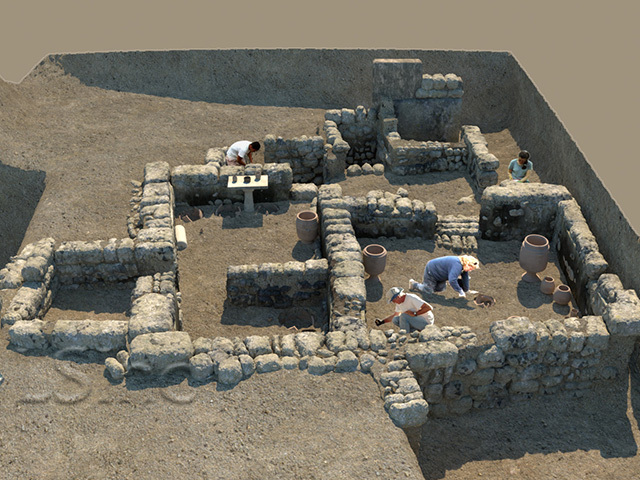 The house is situated in the eastern side of Jewish Quarter (on the northwest corner of Tiferet Israel and Misgav Ladakh Streets; the screen grab at the left from the interactive online research and educational module designed by the Institute for the Visualization of History, for which Learning Sites did the 3D modeling; hover over to enlarge). 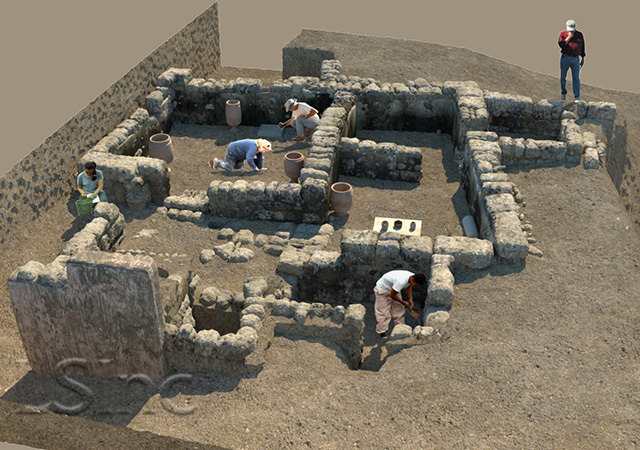 Excavations clearly indicated that the surviving rooms were from the basement (containing workspaces, ovens sunk into the floor of most rooms, a large kitchen-like space, and a courtyard) of a much larger dwelling possibly extending north and east beyond the currently exposed rooms (see the plan at the left; hover over to enlarge; image courtesy of the Institute for the Visualization of History). The walls were unadorned and plain, unusual for houses found in the Jewish Quarter. Many large chalk jars, limestone tables, coins, glass bottles, stone weights, and pottery vessels were found throughout the house (hover over the rendering at the left to enlarge). One stone weight (found in 1970) was incised with a so-called square Aramaic inscription (not the more common Greek) reading "of Bar Kathros" (= of the son of Kathros). The Talmud mentions the Kathros family as one of four large High Priestly familes who apparently abused their status in the granting of duties with the Temple and who really seemed to have ruled the city in the time of Roman Procurators. Among the more revealing and intriguing finds were the lower arm and hand of woman in her early 20s found reaching out as if grasping the step of the doorway of the kitchen (probably trying to escape but caught in the room when the house collapsed). These bones are the only human remains of Roman destruction period found. The animation below shows some of the key remains (click on the image to replay). 1983 "Jerusalem in Flames: the Burnt House captures a moment in time," Biblical Archaeology Review IX.6:66-72. 1983 "Jerusalem Flourishing: a craft center for stone, pottery and glass," Biblical Archaeology Review IX.6:48-65. 1976 Archaeological Discoveries in the Jewish Quarter of Jerusalem, Second Temple Period, Jerusalem: Israel Exploration Society and the Israel Museum (catalogue 144). 1985 In the Shadow of the Temple: the discovery of ancient Jerusalem. Jerusalem: Keter Publishing House and NY: Harper & Row, translated from the Hebrew by Ina Friedman (orig. published 1982). 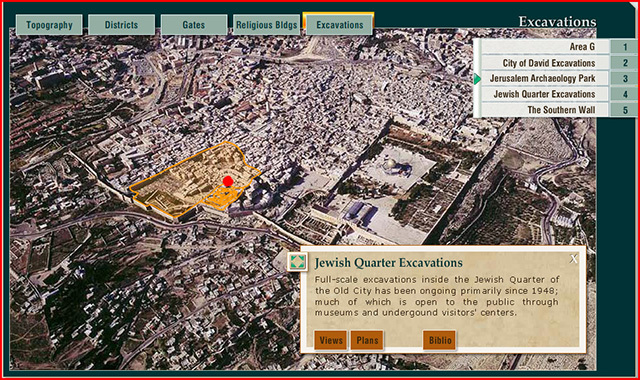 2000 Jewish Quarter Excavations in the Old City of Jerusalem, conducted by Nahman Avigad, 1969-1982, vol. 1 Architecture and Stratigraphy: Areas A, W, and X-2--Final Report, with contributions by N. Avigad, H. Geva, R. Reich, G. Barkay, D. T. Ariel. Jerusalem: Israel Exploration Society, Institute of Archaeology, Hebrew University of Jerusalem. 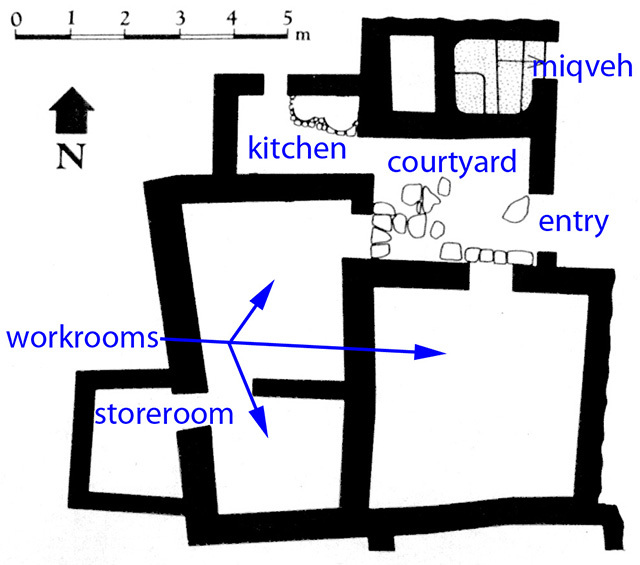 2010 Jewish Quarter Excavations in the Old City of Jerusalem, conducted by Nahman Avigad, 1969-1982, vol. IV: The Burnt House of Area B and other Studies--Final Report. Jerusalem: Israel Exploration Society, Institute of Archaeology, Hebrew University of Jerusalem. 1993 The New Encyclopedia of Archaeological Excavations in the Holy Land. vol. 2:734-5. Jerusalem: Israel Exploration Society.